AlcoCONNECT™ Live is a state-of-the-art tool for safety and business managers seeking real-time, analysed drug and alcohol test data from across their business. We understand that every work place strives to be drug and alcohol free. Alcolizer’s AlcoCONNECT™ Live drug and alcohol test data management system provides you with real-time analysis on the effectiveness of your program. Understanding where and how exception tests occur enables you to target where additional training and support is required. By doing so you can ensure all employees are best able to comply with your site’s safety requirements. You will identify hot spots in your business and target resources so you can maximise the effectiveness of your testing spend. 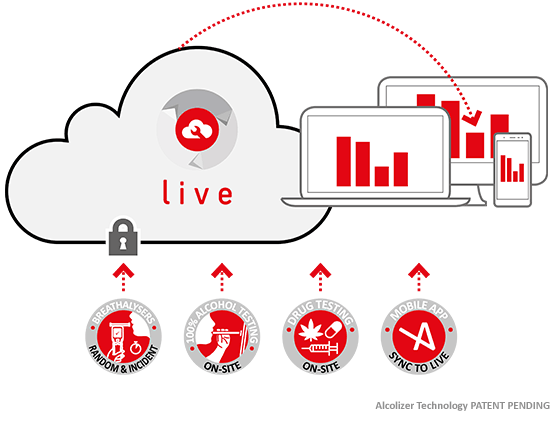 Every drug and alcohol test undertaken by Alcolizer Technology is available confidentially on our AlcoCONNECT™ Live secure data link. Site management can view the data for their site, whilst national managers can see every test. Easy compliance with electronic data – no more paperwork! AlcoCONNECT™ Live records all drug and alcohol test data onto a secure electronic database. Compliance reports are generated from this information and email alerts are sent to management when an exception test is recorded. Alcolizer Technology ensures that your confidential data is available 24/7 and is fully-secure. By using a Secure Sockets Layer, Encrypted link and Multi-Factor Authentication in a Data Centre. AlcoCONNECT™ Live Dashboards provide an easy at-a-glance view of your test data by number of tests, site location time of day and result. Number – the number of readings by month, grouped by Site. Time – the number of readings by time taken. Exception – the number of exception readings by month, grouped by Site. Drill down into this data for access to original alcohol, drug screen and confirmatory toxicology results – do so by clicking (or tapping) the Number and Exception graph columns to open an Activities List. Click/tap an entry in the list to open an Activity Record screen – this is where you can view all details of the test record. Only users that have been set up with appropriate access will be able to view the data within these records. Note: camera photo capture is an optional feature only available on an Alcolizer Wall Mount 4 or via the AlcoCONNECT™ mobile app. Managers with appropriate permissions can access and download various reports such as Breathalyser Activity, Staff Activity and Program Activity. Emailing of reports can be also automated and, when coupled with an internet connected Alcolizer wall mounted instrument, users can receive an email when an exception is recorded. Managers can upload and maintain staff lists containing information such as staff positions and identification data. Multi-site Drug and Alcohol test management. Occupational Health and Safety management and compliance for workplace drugs and alcohol. Look no further than AlcoCONNECT™ Live data management for real-time analysed drug and alcohol data. Talk to us for a demo or a total customised solution, phone 1300 789 908.